Asus spent the latter part of last week teasing us with cryptic videos, all related to the devices they would be unveiling at Computex 2012 this week. Now, all has been revealed, and although we were close with our hypothesizing, the trailers referred to two products and not one. The Asus Taichi isn’t a dual-boot Windows 8/Android device, but it is a dual-screen laptop, that comes in either 11.6-inch or 13.3-inch screen sizes. 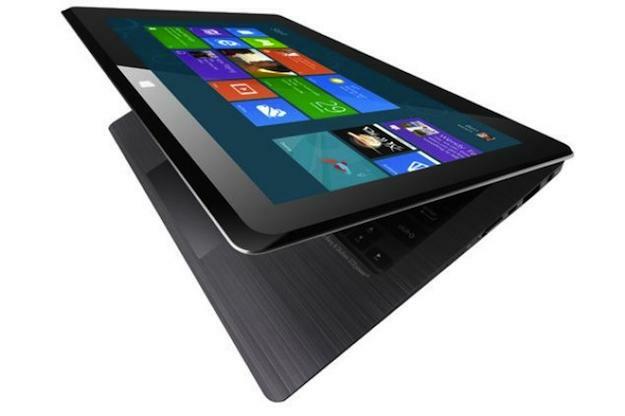 One screen is located on the outside of the laptop’s lid, so when closed it’s like using a tablet. Open the Taichi up, and you’ve got a regular laptop with a keyboard and a trackpad, plus the second screen in front of you. Powered by a third generation Intel Core i7 processor, best known at the moment as Ivy Bridge, the Taichi will also feature a solid-state drive, 4GB of RAM and a 5-megapixel camera. 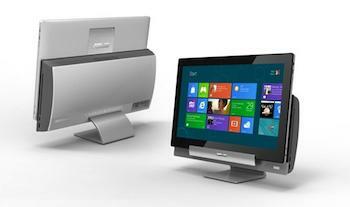 Both screens operate independently of each other, and can be used at the same time. Asus says this will allow a “host of innovative applications” to be developed, but we’re having difficulty visualizing how you would use two back-to-back screens simultaneously, or how it could be used comfortably by two different people. Featuring a massive — for a tablet, at least — 18.4-inch touchscreen, the AiO can be booted into either Windows 8 or Google Android, and separated from the base station to be used as a wireless monitor or a standard, albeit large, tablet. Other than it’ll feature one of Intel’s Ivy Bridge processors, the AiO’s full specification has yet to be confirmed, as has which version of Android the AiO will run. Like Acer’s new collection of Windows 8 hardware, the Taichi and AiO haven’t been given release dates but as Windows 8 is involved, we can expect them to appear sometime after October this year, depending on when Microsoft releases the new operating system. Both the Taichi and AiO are innovative and daring, but is there a market for either? The Taichi especially seems like a niche product, while the AiO’s wireless monitor configuration does at least lend itself to a few more situations. As with everything, it’ll come down to price, and Asus is keeping that information firmly under wraps at the moment.